Yawkey the leatherback turtle enters the South Carolina surf. A huge sea turtle found stranded on a remote South Carolina beach over the weekend was returned to the wild today (March 12). The nearly 500-lb. (215 kilograms) leatherback turtle was rescued Saturday (March 7) on Yawkey-South Island Reserve, a barrier island near Georgetown, suffering from low blood sugar and exhaustion. State wildlife officials said it took five people to lug the teenage turtle off the beach and onto a wood platform specially built to carry it to the South Carolina Aquarium's Sea Turtle Hospital in Charleston. The endangered reptile is the first of its kind ever rescued alive in South Carolina, and one of only a handful of live leatherback rescues in the United States, according to the South Carolina Department of Natural Resources. Leatherback sea turtles migrate northward along the East Coast during spring and are currently nesting offshore Florida. Named Yawkey, the turtle was treated for its low blood sugar and a possible intestinal blockage, and also received vitamins and antibiotics to combat any possible infections. Biologists estimated that Yawkey is about 10 to 15 years old. Because leatherbacks fare poorly in captivity, aquarium staff planned to release the rescued turtle as soon as possible, aquarium representatives said earlier this week. Yawkey was acclimated to cool water temperatures and tagged with a microchip and flipper tags before the turtle's release, they said. The leatherback turtle is the largest of all turtles and one of the largest living reptiles. They are named for their shell, which is a leathery carapace instead of the hard shell found on other turtle species. The leatherback's big body, large flippers and light carapace are designed for long-distance ocean travel. Adults live in the open ocean, and populations in the Pacific and Atlantic Oceans regularly cross back and forth between continents, from nesting sites to feeding areas. 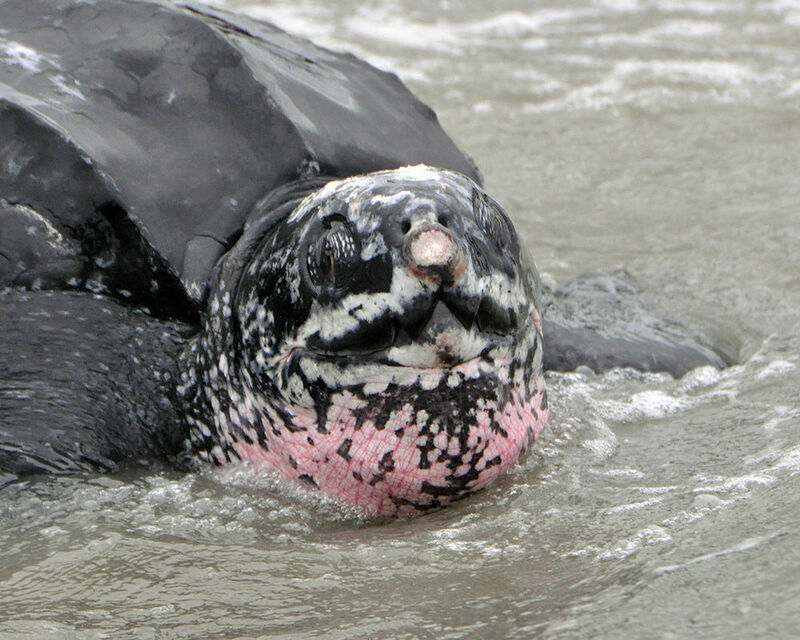 The Pacific and Southwest Atlantic leatherback populations are considered critically endangered and are protected under the federal Endangered Species Act. Leatherbacks feed almost exclusively on soft-bodied ocean creatures, such as jellyfish and squid, and often mistake floating plastic bags for their favorite food. Swallowing the bags can kill them. Sea turtles are also often caught in fishing gear, which traps them below the surface, where they drown. People also harvest leatherback eggs for food, which has decimated their population in some regions.